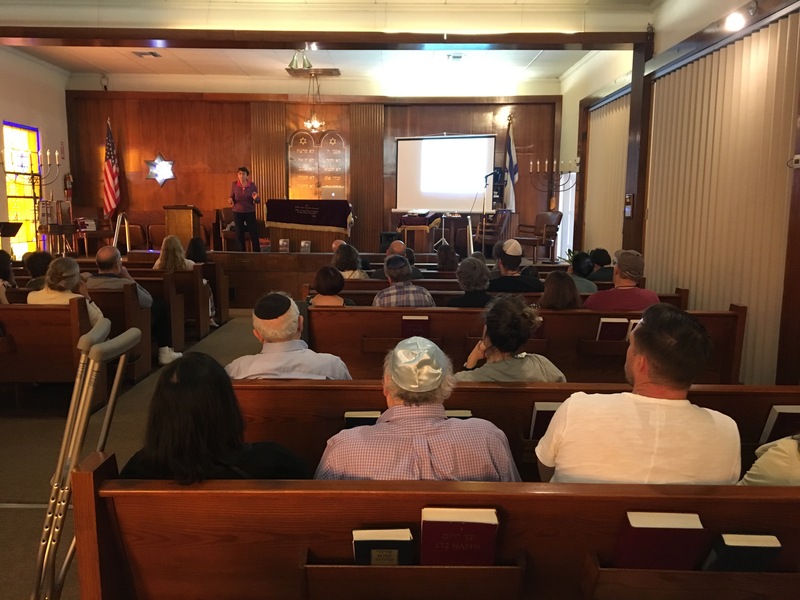 In honor of International Holocaust Remembrance Day, I invited Dr. Monique Saigal-Escudero to present a lecture through a joint program put on by my non-profit Oneg Shabbat, Français du Monde, and Temple Beth Israel. The powerful lecture alternated between historical overview and Monique’s personal story. At age 3 she was put on a train from Paris by her grandmother to hide in the South West of France. When she arrived in the South West, she burst into tears at the train station. No one arrived to pick her up and she was spontaneously taken in by a devout Catholic family. The family since been awarded the French Legion of Honor and the title of Righteous Among the Nations by Yad Vashem. Dr. Monique Saigal-Escudero at the book signing and reception after the lecture. The audience spanned the age range, with curious and vocal young people asking questions and participating. In order to ensure no barrier to entry, tickets to the lecture were offered free to the public. Students from a nearly university arrived to learn Monique’s story. Many from the French community brought their children to hear this important testimony. TBI members mingled with Jewish visitors from the West Side and Sacramento, Francophones, and our friend from the LAPD joined us along with many from the Claremont Colleges. We were honored to be addressed by the Deputy Consul General of France, Matthieu Clouvel to open the lecture. Everyone was invited to a reception and book signing. Many of the attendees remarked on the emotional impact of the story. One member of TBI mentioned that his grandmother (who had also perished in the Holocaust) shared a name with Monique’s grandmother and the similarities in their stories touched him. After the end of the talk, questions were so many that I had to appeal to the audience for permission to extend question time twice! Even at the expense of macaroons and pear cider!